One of the most common challenges that we all face today is overwhelm. It’s not always easy balancing work that never ends (thanks internet… lol! ), our health, our family life, our social life… and all of the other million things that come up every day. Whenever I find myself overwhelmed, one of the first things I notice is how constricted my breathing gets. And one of the first things I do to bring down the overwhelm and to bring myself back into balance is to tap on my breathing. So today, I want to suggest that you tap along with this quick Tapping script. It will help you to get grounded and to find your breath, so that you can be more present and relaxed during your day. Start off by thinking about your day or weekend. What things do you have to get done? Are there things you’re stressed about with the weekend? How do you feel about your week? Did it go well? Are there things that you’re still carrying from the week? As you think about these things, notice your breath. How restricted does it feel? 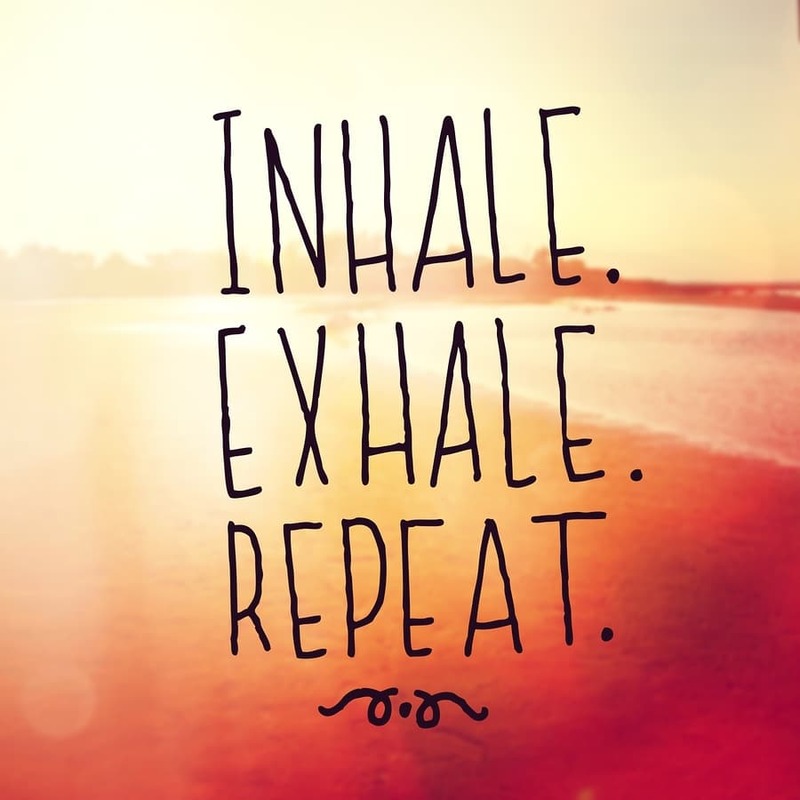 Is it easy or difficult to take a deep breath? On a scale of 0 to 10, with 10 feeling like your breathing is very constricted, and 0 being that you can easily take a full, deep and long breath, where is your breathing right now? KC: Even though I’m so overwhelmed by everything going on in my life right now, I choose to bring some relaxation to my breath. KC: Even though I’m so overwhelmed by everything going on in my life right now, and it feels like I just can’t keep up, I choose to bring some relaxation to my breath in this moment. KC: Even though I’m so overwhelmed by everything going on in my life right now, and I don’t know how I’ll possibly get it all done, I choose to bring some relaxation to my breath and be still in this moment. Under Arm: How can I possibly relax? UN: What if I could approach my weekend with more breath? CP: How much easier would each day be? CB: What if I could allow myself to breathe during the entire weekend? UA: What if even during the stressful moments, I could find my breath again? Now take a deep breath in… hold it… and then out again. And do that 2 more times. In… hold it… and then out again. In… hold it… and then out again. Did it improve? What did you notice as you did the tapping? How will you approach your weekend differently now? Let me know by leaving me your comments below. How do you feel after going through that tapping exercise? Let me know below! During tapping I felt an increasing desire to breathe more deeply and now feel more oxygenated ….must be good for the brain ! Will continue with this whenever I feel breathing has reduced or become suppressed. Thank you Nick . I think the tapping is fab – I was holding my breath as I’m packing and preparing to go away for a few days and feeling the pressure of a deadline – I gave this a go and voila! I can’t stop yawning now tho’! Homebound 84 yr old with a rare muscle disorder, I also replaced week for the weekend. Our family faced a sudden loss of a loved one this weekend and this has helped me to relax. Relaxed so much that at 7:17 AM I want to sleep, which I need. I was awakened early. I can only sleep for 3 hrs at a time because of my disorder. I may not sleep, but I will rest because my body requires it. Thank you, Nick. It is absolutely amazing what this method (tapping) can accomplish. I learned meditation a long time ago, but certain circumstances intervened and made me so stressed that I didn’t dare stop and meditate because a flood of anxiety would occur. I find that tapping, for whatever the reasons, helps me to focus and accomplish a huge decrease in anxiety effortlessly. Monday morning. I am back at work after a long week last week and a weekend of attending Mom and her needs. I will use this to bring me back to center. thank you. This will also help my patients. I have not been able to relax for a long time and fine it hard to breath; sometimes I can only take short sharp breaths, which sounds like a little snort. This is not funny. I did the tapping and it did make me feel a lot better so well do it often and hopefully I will come right again. I have been practicing breathing but not with Tapping however with Tapping, it is so much better. Thank you. Thank you Nick. Always Right On! My breathing went from 8 to 4 or maybe 3! In just those few minutes. Calming. Relaxing. I feel like it will stay with me for some time. Muchas gracias! Thanks for sharing this tapping exercise. I want to let you know that if I have a problem falling asleep, I will tap for a few minutes and it quiets my mind and totally relaxes me. It is amazing to me. I so thankful to you and look forward to all the positive comments from others. Thanks for the tapping script. A good reminder of what I need to do when I feel withdrawn & overwhelmed. I was an 8 when I started, taxed and overwhelmed with business. I’m a 2 now! Perfect choice. Thank you! That’s so great to hear, Semaj! This was very helpful and came at the perfect time. I was feeling so overwhelmed and forgot about tapping. Then I saw your email Nick. I feel much better. I plan to tap every day again. Wow, just came from the gym and was a bit out of breath. Now I feel great. Thanks Nick! Perfectly timed. The beginning of a wonderful weekend. BREATHING with each moment. Being present. Being here. Dear Nick :-))) Thank you so much for putting this up there. It’s great to have a Tapping Script to fall back on. Mostly in times of need, your routine or memory flies out the window, so having a copy is handy for just this purpose! Being overwhelmed, can happen to anybody at any time. In such moments EFT makes such a difference. Many thanks to you (& Jessica) for keeping the EFT wheel spinning!Have a great weekend! Being printed as I write! Many blessings, Nick. I have difficulty actually getting myself to do the tapping (I need to tap that too!). Have your book and cds! Just reading your script this morning has lifted me into hope and peace as I breathed and adaptedyour words somewhat to reflect my situation. Thank you. I was doing really well, more and more relaxed, laughing at times, until “Regardless of what happens this weekend, I will be ok”. When I said that I was filled with self-doubt and my breathing tightened up again. I guess I need to tap on that next? Just what I needed to start the weekend, thank you Nick! Thank you for this script, it reminded me to take the time this weekend and just breath! Life is good! Deep breath brings me back to feeling serene and confident of myself. Your script gives me the exact expressive words I need to carry out the tapping successfully from worrysome to total ease. Feeling grateful of having known you. Sending blessings to you now. Thank you so much Nick…you really make me feel so good!